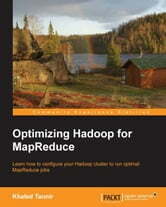 This book is an example-based tutorial that deals with Optimizing Hadoop for MapReduce job performance. If you are a Hadoop administrator, developer, MapReduce user, or beginner, this book is the best choice available if you wish to optimize your clusters and applications. Having prior knowledge of creating MapReduce applications is not necessary, but will help you better understand the concepts and snippets of MapReduce class template code.